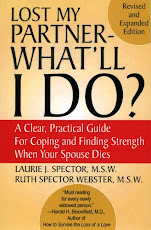 In this couple-oriented culture of ours, there is often pressure from well-meaning family and friends to date soon after your partner has died. Although this usually occurs more to younger widowed, pressure at any age is unwelcome. Any decision about dating is yours alone. You may need more time to heal from the loss and are clear about not wanting to date at this time. But you may change your mind down the road. Or you may be clear that you are definitely not interested in another romantic relationship. Whatever your choice, it’s a personal matter and others need to respect that. 1) "Thanks for your concern but I’m really not interested (at this time)." 2) "While I appreciate your concern, my dating days are over - and I’m really okay with that." Keep in mind however, that after losing a partner, it’s important to eventually form new (not romantic) relationships that will provide friendship and support. Remember too, that you are the best judge of what is right for you.